With Mother’s Day quickly approaching, you might be wondering just what to do to show appreciation to the mother (or mothers) in your life. Whether you want to thank your wife for everything she does for your family, or show appreciation to your own mother for all she’s done for you over the years, the fact remains that you can’t go wrong with preparing her a lovely, delicious dinner. Now this dinner needs to be something special, something she’ll love to try again! How about homemade seafood chimichanga lobster and shrimp? We know – it sounds complicated, but it’s not! We’ve made this recipe easy to prepare! This time-tested recipe is a generational favorite here at Macayo’s, and if your mother or wife is a seafood lover, this is sure to be a new favorite for her. If you really want to get fancy with this recipe, you can slice the peppers yourself and even make the pineapple pico de gallo from scratch. Fresh pineapple is a wonderful addition to this recipe! See our pico de gallo recipe here for a place to start. Got all the ingredients you need for this wonderful Macayo chimichanga recipe? Great! All that’s left to do now is to put it all together. Start by placing the poblano and bell pepper strips on a flat top, along with some seasoned vegetables (and melted butter, to keep them from burning). Next, add the shrimp to the flat top, cooking them halfway with liquid butter before adding the lobster to the mix. Keep on the flat top and flip as needed until the veggies, shrimp, and lobster are evenly cooked all the way through. Grab a burrito-sized flour tortilla and pile a portion of the vegetable/shrimp/lobster mixture into the center of the tortilla. Roll up tightly and then fry in oil until golden brown. 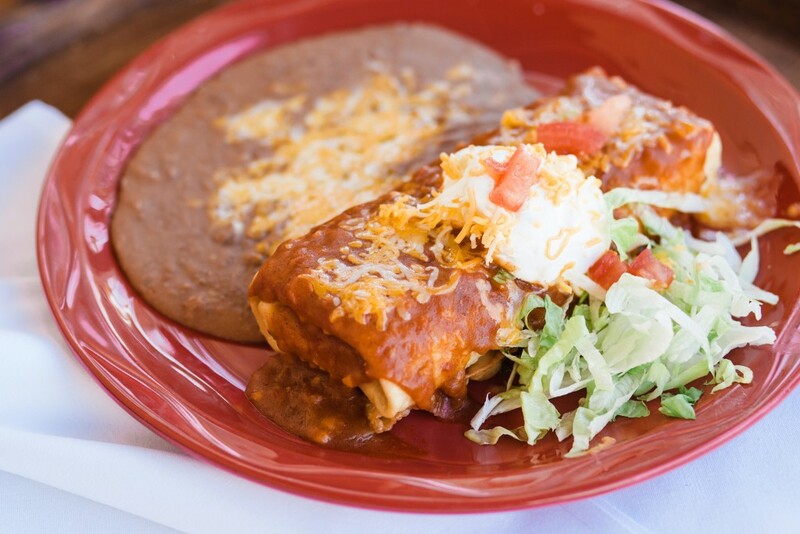 On a plate, spoon the black beans with jack cheese next to the chimichanga. Top the chimichanga with a generous amount of the tomatillo sauce, jack cheese, and pineapple pico de gallo. This recipe for seafood chimichangas with shrimp and lobster is sure to impress your loved one on Mother’s Day (or any other day of the year). And because it can be prepped and ready to eat in less than an hour, this also makes for the perfect weeknight meal. No time to prepare your own Mother’s Day meal? Mothers are a big part of the Macayo’s tradition, and we’d love to celebrate yours! Come by your nearest Macayo’s location on Sunday, May 10!